Remembering a friend today, Presley and her family. She lived a long and fortunate life with a family that loved her very much. 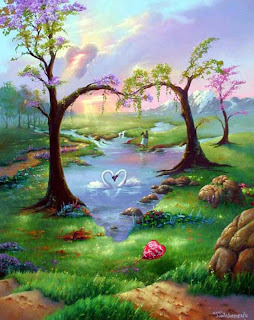 There are seven hearts hidden in the scenic photo here, for you 'P'. Her mom wrote a beautiful poem about her and posted a photo at http://juliekingart.blogspot.com/ . I don't even want to think about how lost my family would be without me.....what would they do without my guidance and entertainment? Count your blessings fur buddies of any kind - short tails, long tails, no tails, meower or barker, purebred or mixed, pedigree or no degree, a beauty or a mug only a mother would love, obedient or stubborn. Remember, you are one of the fortunate ones with a loving home and thanks to all the 'two legs' out there that are watching out for the furry creatures on earth, bully blessings to you. Love your family, don't wee on the floor or chew up the table corner. Woof and good health to all my buddies Snuffles, Annie, Luna, Emma, Tonka, Dizzy, Friday, Penny and Snickers. Finally - Presley, good buddy, enjoy all the bones, treats and toys that you desire, you are missed! Sorry for the sadness of this loss. oh you are the sweetest friend to remember presley in your blog post today. your words have touched my heart and eased a bit of my heart ache. like presley, you know apollo that you are loved and lucky. hugs to you apollo and your family for your caring thoughts!! Oh how sad. 16 years is pretty good, but they should live longer. Annie will be five in Nov. The years go to fast. PS, I think I found all seven hearts in that lovely painting. We're never ready to let them go. They leave huge pawprints on our hearts forever. Rest easy Presley. Blessings to your loved ones left behind. Apollo, you are so sweet to write such a lovely tribute to your friend Presley. Oh Apollo what a beautiful post. You are so wise!